It was a fine Wimbledon weekend of hot, holiday tennis at Sun Valley Tennis Club where the 20-class Lyle Pearson Fourth of July Tennis Championships were staged July 4-6. Sun Valley head tennis professional Mark Rodel won the Men’s Open Singles crown 4-6, 6-3, 6-3 over Tyler Neill of Pocatello. A native of South Africa, Rodel was team captain/All-Big Sky during his final season competing in tennis for Utah’s Weber State University in 1997. Rodel, who gravitated to bicycle racing after college, just finished five years as assistant tennis coach for men and women at Pocatello’s Idaho State University. He’s the father of two. His diverse background includes business pursuits like being CEO for his Peak Tennis Training. Women’s Open Singles champion was Seattle University All-WAC second team tennis player Kelli Woodman, 18, from Cherry Creek High School in Denver, Co. The 2012 Colorado high school state champion dropped only two games in three straight-set wins. In Open Mixed Doubles, Woodman teamed for first place with Nate Gross, 23, a four-year Idaho State University tennis starter from Analy High School in Sebastopol, Ca. Gross, a graduate assistant at Saint Joseph’s University, is working as an assistant tennis pro at Sun Valley. Men’s Open doubles winners were top-seeded Ethan Asher of Boise and Tyler Neill of Pocatello, the former University of Idaho head women’s tennis coach now working as an attorney. Tournament director John Perry said there were 160 players this year, quite a bounce-back from last August’s Sun Valley tournament with its turnout reduced by wildfires. This time, there were 20 classes—eight men’s classes, eight women’s categories and four in mixed. Locals claiming class victories included Sun Valley’s Amanda Alexander. She won Women’s 4.5 Doubles with Linda Butler of Eagle, and also captured the Mixed 9.0 Doubles title with partner Joe Writer of Boise in a thrilling 5-7, 6-3, 19-17 championship. Wendy Cairncross of Ketchum and Ann Doerflein of Sun Valley earned the Women’s 3.5 doubles title. And top-seeded Kurt Almquist of Ketchum took the Men’s 4.0 Singles championship. Complete top class results are on today’s Web Site. Men’s Open championship—No. 2-seeded Mark Rodel of Idaho Falls, the Sun Valley Tennis Club head tennis professional, won 4-6, 6-3, 6-3 over No. 1-seeded Tyler Neill of Pocatello, the former University of Idaho head women’s tennis coach and College of Idaho player. Consolation final—Vjekoslav Bampa of Twin Falls 4-6, 7-6, 10-6 over Jack Leitzinger of Boise (12 players). NTRP (National Tennis Rating Program) Men’s 4.5 championship—No. 2-seeded Christian Schaffeld of Boise 7-5, 6-2 over No. 1-seeded John Armstrong of Boise. Consolation final—Kory Putnam of Twin Falls 6-1, 6-2 over John Stiffler of Boise (11 players). NTRP Men’s 4.0 championship—No. 1-seeded Kurt Almquist of Ketchum won three matches in straight sets including his 7-5, 6-4 title match win over No. 2-seeded Kirk Porritt of Boise. Consolation final—No. 4 Phil Ellis of Jerome 7-6, 7-6 over Jason Draper of Meridian (12 players). NTRP Men’s 3.5 championship—Kurt Snedeker of South Ogden, Utah 6-0, 6-1 over Rico Sims of Meridian. Consolation final—Brian Buckingham of Boise 7-6, 6-3 over Mark Lewis of Pocatello (5 players). Women’s Open championship (round robin)—First place: Seattle University sophomore tennis player Kelli Woodman of Denver, Co. Second place: Madison Maloney of Idaho Falls. Third place: Sheila Walker of Washington, D.C. (4 players). NTRP Women’s 4.5 championship—In a rematch of last year’s 4.0 singles final, 2012 Idaho State 3A girls’ singles champion Emily Tesnohlidek of Fruitland prevailed again 6-3, 6-1 over Haley Cutler of Hailey. Cutler, the 2013 Idaho State 4A girls’ doubles winner and 2014 State 4A mixed doubles champion, will be a senior at Wood River High School. Consolation final—Mary Pat Lee of Seattle, Wash. 6-4, 6-4 over Maya Burrell of Ketchum (5 players). NTRP Women’s 4.0 championship—2013 State 3A girls’ doubles champion Abby Tesnohlidek of Fruitland 5-7, 6-1, 6-1 over Alexandra Hills of Tiburon, Ca. Consolation final—Mary Foust of Sausalito, Ca. by default over Cynthia Curry of Arlington, Texas (6 players). NTRP Women’s 3.5 championship—Jen Flash of Meridian 6-2, 6-1 over No. 2-seeded Kimberly Howard of Boise. Flash defeated No. 1-seeded Sunny Poppler of Boise 6-0, 6-1 in the semi-final. Consolation final—Jennifer Johnson of Boise 6-0, 6-3 over Barbara Tesnohlidek of Fruitland (8 players). NTRP Women’s 3.0 championship (round robin)—First place: Cynthia Hills of Tiburon, Ca. Second place: Leah Bowman of Boise. Third place: Melissa Buckingham of Boise (3 players). Men’s Open championship—No. 1-seeded Ethan Asher of Boise and Tyler Neill of Pocatello 6-3, 6-4 over Sam Lemmon of Emmett and Nick Petterson of Boise. 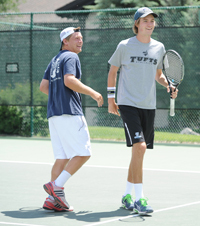 In the Main Draw semi-final, Lemmon and Petterson prevailed 4-6, 7-6, 10-8 over Karl Wilander of Hailey and Theodore Morgan of Wayne, Pa. Wilander, the 2012 Idaho State 4A boys’ singles champion, plays college tennis for Tufts University while Valley Club junior pro T.J. Morgan will be a sophomore playing tennis for Lafayette College. Consolation final—Gavin Hatter of Meridian and Tyler Oram of Boise 6-1, 6-1 over Jan Michael Jordan and Nick Jordan of Boise (7 teams). NTRP Men’s 4.5 championship—No. 2-seeded Christian Schaffeld and Joe Writer of Boise 6-1, 3-6, 10-5 over No. 1-seeded Greg Ferney of Boise and Sam Lemmon of Emmett. Consolation final—Mike Buckingham and Ken Kester of Boise 6-2, 7-5 over Doug DuFur and Dan DuFur of Sun Valley (8 teams). NTRP Men’s 4.0 championship—Last July’s runner-up team in 4.0 doubles, Phil Ellis of Jerome and Robert Welch of Twin Falls, played as the No. 2 seed this year and won 6-3, 7-6 over Jeff Buckingham and Russell Morehead of Boise. Buckingham-Morehead had beaten No. 1 Kurt Almquist of Ketchum and Robert Clifford of Boise 6-2, 5-7, 6-3 in the semi-final. Consolation final—Greg Ferney of Boise and Michael Ferney of Caldwell 6-4, 7-5 over Vjekoslav Bampa and Duncan Roberts of Twin Falls (8 teams). NTRP Men’s 3.5 championship (round robin)—First place: Erik Lewis of Twin Falls and Mark Lewis of Pocatello. Second place: Tony DeVall and Paul White of Eagle (3 teams). NTRP Women’s 4.5 championship—Amanda Alexander of Sun Valley and Linda Butler of Eagle 6-3, 6-3 over Janice Ehrhart of Boise and Pamela Massey of Eagle. Consolation final—Trish Quarles and Valerie Roberts of Boise 6-1, 6-1 over Mary Pat Lee and Alex Turnure of Seattle, Wash. (6 teams). NTRP Women’s 4.0 championship—Last July’s 4.0 doubles runner-up team of Amy Bailey and Dawna Buckingham of Boise 6-2, 4-6, 10-6 over Diana Gastanaga and Kerri Porritt of Boise. Consolation final—Tina Measham of Boise and Janet Zandersmith of Star 6-4, 7-6 over Robin Ivanoff and Melinda Neely of Boise (8 teams). NTRP Women’s 3.5 championship—Wendy Cairncross of Ketchum and Ann Doerflein of Sun Valley 6-2, 6-2 over Cindy Biedebach and Teresa McDonald of Boise. Consolation final—Cindy Haroian and Isabelle Haroian of Boise 6-4, 7-6 over Denise DeCoster and Hetty Morgan of Hailey (8 teams). Mixed Open championship (round robin)—First place: Former Idaho State University tennis player-current Saint Joseph’s University graduate assistant Nate Gross of Sebastopol, Ca. and Kelli Woodman of Denver. 2011 Sun Valley Mixed 9.0 doubles winners Karl Wilander of Hailey and Madison Maloney of Idaho Falls won 6-4, 6-4 over Dan Buckingham and Rilee Morehead of Boise. Wilander and Maloney lost 4-6, 6-2, 10-8 to Leo Miranda of Texas and Sheila Walker of Washington, D.C. (4 teams). NTRP Mixed 9.0 championship—Joe Writer of Boise and Amanda Alexander of Sun Valley 5-7, 6-3, 19-17 over No. 1-seeded Brian Johnson and Lynda Dimick of Boise. Consolation final—Mike Kirby and Diana Gastanaga of Boise 6-4, 6-2 over Andrew Parsons of Mercer Island, Wash. and Haley Cutler of Hailey (6 teams). NTRP Mixed 8.0 championship—Rico Sims of Meridian and Lynda Dimick of Boise over Kirk Porritt and Kerri Porritt of Boise. Consolation final—John Armstrong and Sunny Poppler of Boise 7-5, 7-5 over Jordan Miller and Tina Measham of Boise (12 teams). NTRP Mixed 7.0 championship—Tony DeVall and Errika Saxey of Eagle 6-2, 4-6, 10-8 over Clayton Cutler of Hailey and Samantha Taylor of Ketchum. Consolation final—Andrew Haroian and Cindy Haroian of Boise over Mark Nieves and Susan Nieves of Ketchum (7 teams).